I don’t recall how I first heard about cooking things in hay but I saw an episode of a show with Tom Kerridge in it on the BBC that reminded me recently. “Now that right proper grub” he said (or something like that, probably) in his West Country twang. I was a little sceptical to be honest. I love the smell of cut grass and hay, it reminds me of growing up at home playing in the woods and fields at the back of the house, but to flavour meat? Hmm. 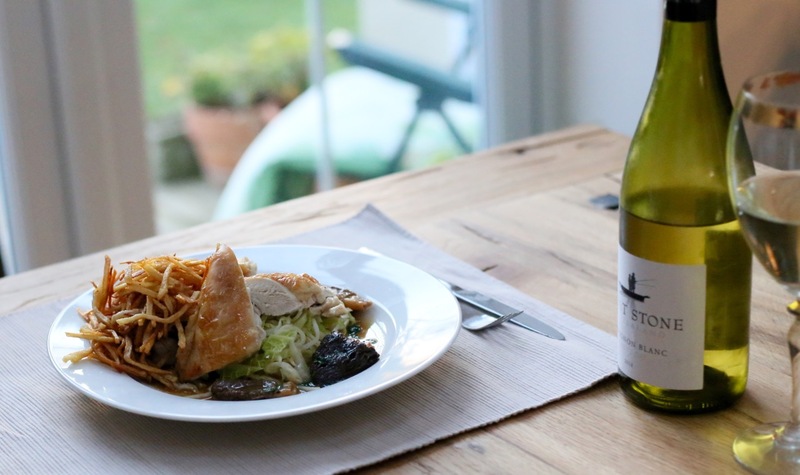 It certainly looks the part – chicken, baking parchment and straw – this is hipster heaven. I believe Mr Kerridge added some cider to his but I stuck with some chicken stock I had in the freezer. Chicken simmered in chicken stock: it’s pretty chicken-ey. I’m not sure about the hay effect, but then I did use greaseproof baking parchment to cover the meat as I didn’t have enough muslin cloth left to do the job, maybe it did too good a job job of separating the bird and the hay. 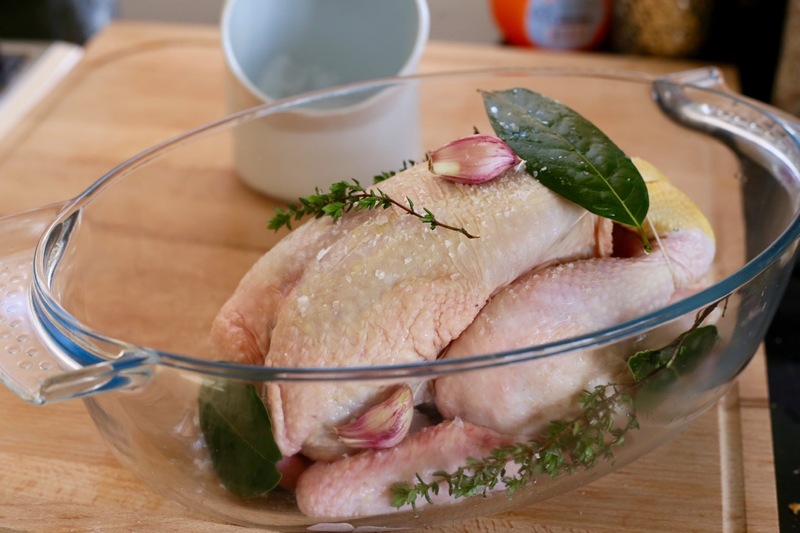 I find whole chicken a sod to flavour at the best of times though – get past the skin and it’s a often a fairly bland affair even after days of marinading. The flavour, almost sweet and nutty, was definitely more noticeable from the bottom half, where it came in contact with the hay and the stock, so it was probably my fault for not being organised enough with the equipment. I’ll do this again one day. To serve it I had some nice morel mushrooms, mixed cabbage and a reduction made from the cooking liquor with a little Muscat for good measure. Hay or not, this was a nice dish mind you and it made it a bit of fun for the kids. Lastly, to go with the theme, some shoestring fries – they kind of look like hay you see…..
1 whole chicken. Preferably one happily running around freely before it met it’s maker. A few handfuls of hay. 6 garlic cloves. Unpeeled and bashed with the side of a knife. Muslin cloth (preferably not the parchment I used here). 3 or 4 morel mushrooms per person, depending on size. Wrap the chicken in muslin cloth with the garlic, bay leaves and thyme and tie. The parchment I used here was OK, but this would have been better. Place in the bottom of a snug fitting lidded pot and pack the hay down the sides and over the top. Heat the stock and pour it over, place the lid on and cook for around 2 hours at 160ºC/320ºF – check it with a temperature probe. 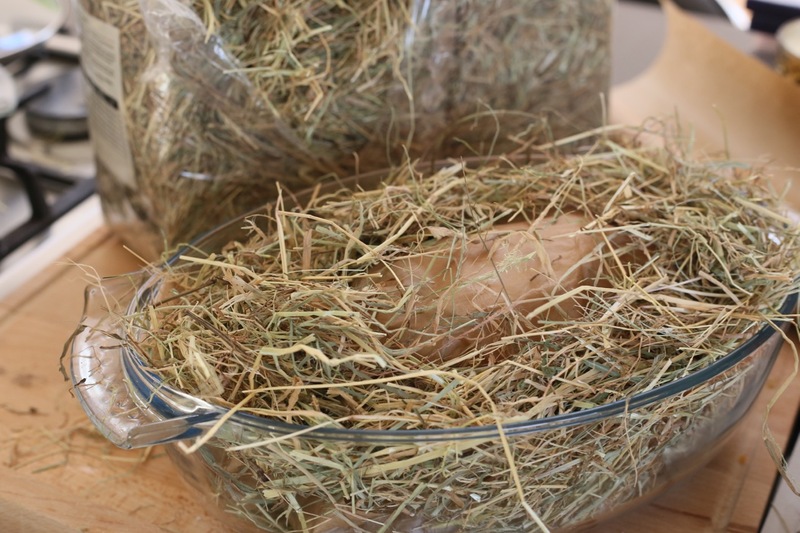 Once done, remove the chicken and using a carving fork in the cavity, rinse off any hay under a tap. Pre-heat the oven as hot as it will go and put the chicken back in briefly, on a baking tray to crisp up/colour. Not too long or it will dry. Leave to rest under some foil and finish the rest. Strain the liquor twice – through a regular sieve and then through a very fine one, or muslin cloth if you have either of them. Set aside in a jug. Prep the veg – slice a mixture of savoy and white cabbage thinly and matchstick the potatoes (keep in water to stop them going brown, but dry well before using). Place the cabbage in a steamer for a few minutes until softened, but not ‘school-dinner soggy’. Fry the morels in a good knob of butter. 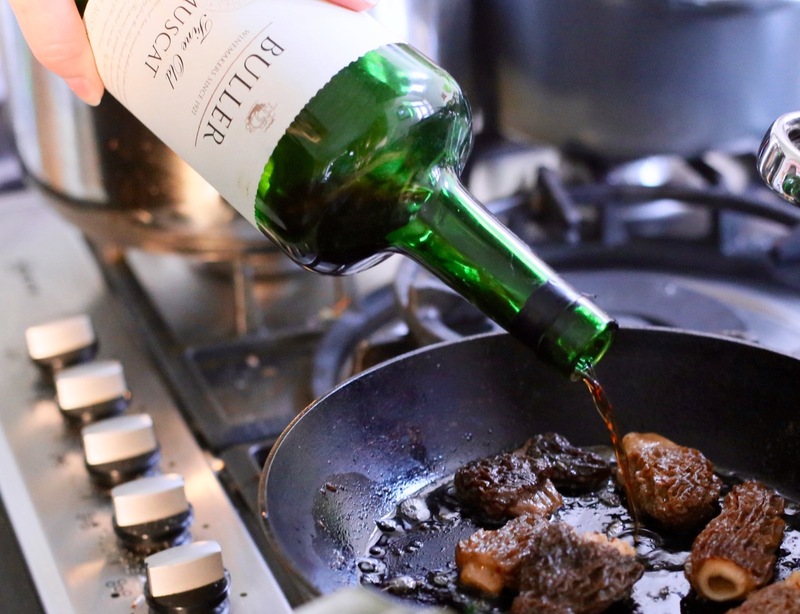 Once nearly done, add a good splash of muscat (a couple of tbsp), stir and remove the morels, keeping them warm. Pour in the cooking liquor and reduce until it thickens and flavours intensify. Taste and season if necessary. Add the morels back to the pan, turn off the heat and stir through some chopped parsley and another knob of butter. Keep warm. Pre heat the deep dat fryer. Carve the chicken on a warmed plate and place on top of the cabbage. Spoon on the morels and a few tablespoons of the reduction – it should be very rich. Last of all briefly fry the potatoes at around 170ºC/340ºF until crispy, it will take only a minute of two. Season with seat salt and serve them straight away or they can go soft. A nice citrusy New Zealand Sauvignon Blanc went very down very nicely too. 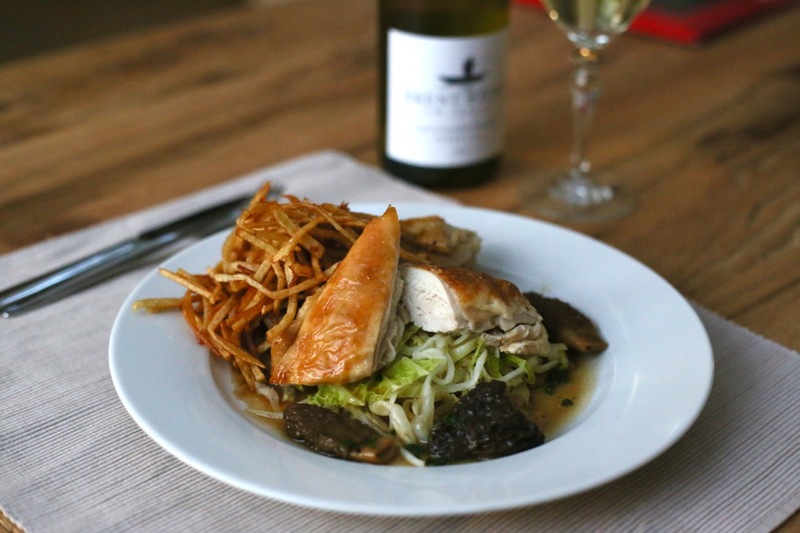 This entry was posted in Recipes, Uncategorized and tagged chicken and morel mushrooms, hay roast chicken, Roast Chicken, shoestring fries by Phil @foodfrankly. Bookmark the permalink. I wouldn’t be surprised MD. This type of cooking, borne out of necessity and austerity is still very much in fashion at the moment isn’t it? Although the Italians have been showing us the way for years of course….Think I’ll try this with lamb next. This is interesting! I don’t think I’ve seen this technique before but I am willing to experiment:) thanks for sharing! This sounds good!!! Thanks very much. Definitely give it a go, but as I mentioned, I’d try and use some muslin cloth. Apparently it’s really good wrapped completely in foil and slow baked over indirect barbecue heat too. Time to wheel our the Webber…. Excellent Phil. Beautiful looking dish. My Mum tells me that back during the second world war, things were cooked in hay. However, the method was very different. A dish would be initially heated on the sparse gas flame and then the pot would be placed in box packed tight with hay. It would be covered and left overnight. The excellent insulation of hay would allow the dish to slow cook until needed the following day. The dish would even retain enough heat to serve from the pot, I believe. Thanks Conor and an indirect thank you to Mrs Bofin for that too! I’m intrigued. I must give that a whirl seeing as I have a ridiculous amount of leftover hay and a garage full of old boxes. I’d been throwing money down the drain. It does look great. In this house I would probably have set fire to the hay, much to the joy of the children…. Cheers. I can we’ll imagine as there’s nothing more ‘exciting’/’funny’ in this house than when I set the fire alarms….I actually looked into to doing this on a kettle BBQ, but I refer to back your comment above. A very wonderful tasty dinner, dear Phil!!! I loved this cool post!